For those who are interested in a mega cheap tablet PC you could do worse than check out Conrad.de (they also ship outside Germany) who currently have an 7-inch Android 4.0 tablet on sale for €99. This is a rather basic tablet but is a nice way to see if you are interested in taking the plunge from moving from IOS to Android – I am considering dumping Mac/IOS after a near 10 year relationship. Hence my interest in this topic. As I said this is a cheap and not surprisingly basic tablet but does seem reasonably responsive. Indeed it was happily switching between apps and playing movies without any problem. Although it should be said that the display sometimes feels a little sluggish especially when scrolling through your email folder. The display itself is generally ok but is certainly not the best available, as the resolution is a rather low 800 by 480. This means that while it is suitable for occasional reading of content or viewing videos it is not anywhere near as pleasant to read from as either an IPaD or Amazon Kindle. Pictures are also quite grainy which is a bit of a disappointment. That said it is much cheaper so you cannot expect miracles. In general though I would always favour the Kindle for reading books or newspapers, while the IPaD is ok, I generally do not enjoy using it for reading ebooks etc. In terms of raw speed I carried out an informal benchmark using the AnTutu took which returned a score of 2866. This puts the tablet on a level with HTC Flyer from 2011, and about 20% less than other more expensive tablets that were available in summer 2011 (source: Techradar.com) therefore this is no speed demon but is fast enough for everyday tasks. Slowness is best personified when using the default browser, it frequently seems to stop at the end of downloading and rendering a page. However, downloading the free and excellent Opera Mobile Browser soon rectifies this problem. In general through this is a seven inch tablet so browsing pages is not always so pleasant given it’s size. The user experience is overall very pleasant but this is down to Android 4 rather than the device itself. The light weight of the device makes it more pleasant to hold than larger tablets and ideal for watching a video in bed. The case is also quite solid and it feels significantly better than the Archos Tablet I played around with recently. Surprisingly the Xelio does not work out-of-the-box with the Google Play store and instead you are forced to use AndroidPIT to download applications. This is especially annoying as often AndroidPIT directs you to Google Play then you are unable to do anything. However, it is possible to easily install Google Play which will let you download and pay for apps should you wish to do so (click here for more info). The hardware is basic, there is for example no 3G (although that can be added via a stick) and bluetooth and GPS are also missing. 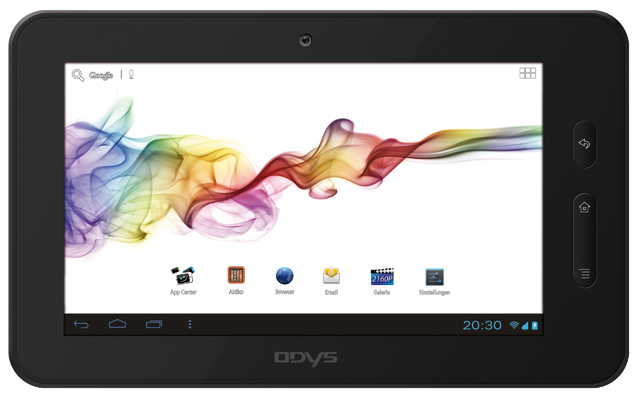 The hardware itself is far behind what you will get with more expensive tablet being a single core Arm Cortex A8. That said it’s performance is adequate for most tasks although the final stages of rendering some more complex websites (in particular those with live video feeds) can at times seem slow. That said full screen video playback is generally much better than my rather old Linux based Atom N270 netbook except with certain live video services such as LiveStation. Wifi connectivity is generally ok and was markedly better in one part of my apartment which used to cause chaos with my IMac. The device also supports up to 32GB on an external SDHC card, this works fine when installed at around around €30 is a worthwhile investment. The only issue is that often finding the SD card within the file browser can be problematic. You can also use the device via HDMI although I cannot vouch for this feature as I have yet to try it. Video playback seems ok, standard TV resolution playback is fine. In short this is a good buy if you want basic Internet browsing and email device that is also capable of playing videos. For me and many others it is also a good device to buy if you plan to dip your toes into the Android and cross-platform development world – more on that soon. It now seems to have broken down, when the device is unplugged from the main power supply it cuts off. I have contacted the manufacturer who provided some advice, so far no luck. That said their customer service rep responded within one day which is pretty impressive for an email response in this day and age. One tip was to reflash the device, sadly this does not seem to be working right now. However, that may be due to my computer and not the tablet. North Korea Launches Android Tablet? This entry was posted in IT Discussions, Mobile Tech, Reviews and tagged android, mobile, tablet. Bookmark the permalink. Hi, nice reading your review of the Xelio tablet. Bought one myself two weeks back from Conrad in Sweden. Reason for me buying it was my earlier (limited but satisfying) experiences from Android on my HTC mobile phone device, and the curiosity how it works on a tablet. The Xelio also fulfilled my price requirements. Since you have the experience … and also mention it in the review, I kindly ask you to give me an advice how to get access to the 16 GB SD card I installed – I simply can’t find it when searching for it. Following the guide it should be named ‘EXTSD’, but I can’t find that. I have loaded it with music files directly in my lap-top, and can reach these files via the Xelio menu. Problem is I cannot access the card directly in Xelio. Can you give any advice? Many thanks to your great web-site, I will follow it from now on. Thanks for visiting my blog and I am glad you got something useful from it. As for the SDCARD. (1) Look for the ES Data explorer file manager and open it. There may be a quicker way but I am quite new to Android 4 so cannot say for sure. Hi, thank you for these instructions – now I have full control. I also just bought this tablet and was happy for a week. After that when I got back to UK it would not boot. I also asked the customer service for help and they showed me where to download the firmware (strangely there is only a link from the German language page and nor from the English page)… but then the PDF telling you how to use the files you just downloaded are only in German and my German is not good enough to understand how to use it… boo hoo. I hope they will answer me again with help in English. Yes, their website support in English at least is pretty poor also the Firmware app is also very badly designed. In the end I tried it a few times as it appeared not to work very well, also it disliked Windows 7. In the end I returned the device I had to the retailer who gave me a refund. That said it was quite a nice little tablet and I would have kept it otherwise. As for the boot problem I had occasional problems with that as well but it was a battery issue, hence why I returned the device. Roligt med en för denna lilla manick. Köpte också hos Conrad, kanonpris. Om man installerar ett SDHC kort och lägger allt man laddar ner på detta går den fortare då än om man gör installationerna på den interna disken? Borde väl vara så eller?